Seven years ago, I visited Hawaii for the first time. As a wedding gift a few years earlier, Jason and I were given a week at a timeshare anywhere in the world. Our plan was to visit Europe. The timing didn’t work out—the only time we could coordinate travel with other things happening in our lives at the time was the winter. We desperately wanted to visit someplace warm. Hawaii was one of the last places on our bucket list to travel to, but I am so grateful that life got in the way of our travel plans. We immediately fell in love with with the islands and the laid back culture. Since that trip, we’ve returned four times. I also fell in love with Hawaiian quilts that can be found everywhere on the islands — on display in museums and swanky hotels, in stores, and of course at local quilt shops. Many of the quilts are mass produced and imported but the original, handcrafted quilts can be spotted. The craftsmanship of the hand needle-turn applique and quilting is remarkable. Equally as impressive are the design of the motifs and the color choices. 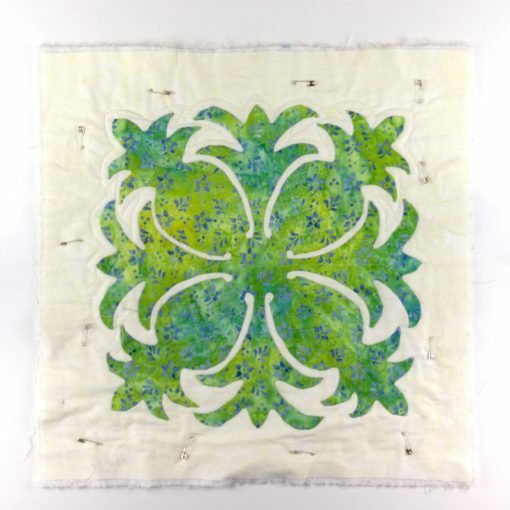 Many of the traditional Hawaiian quilts use solid colors in bold ways. 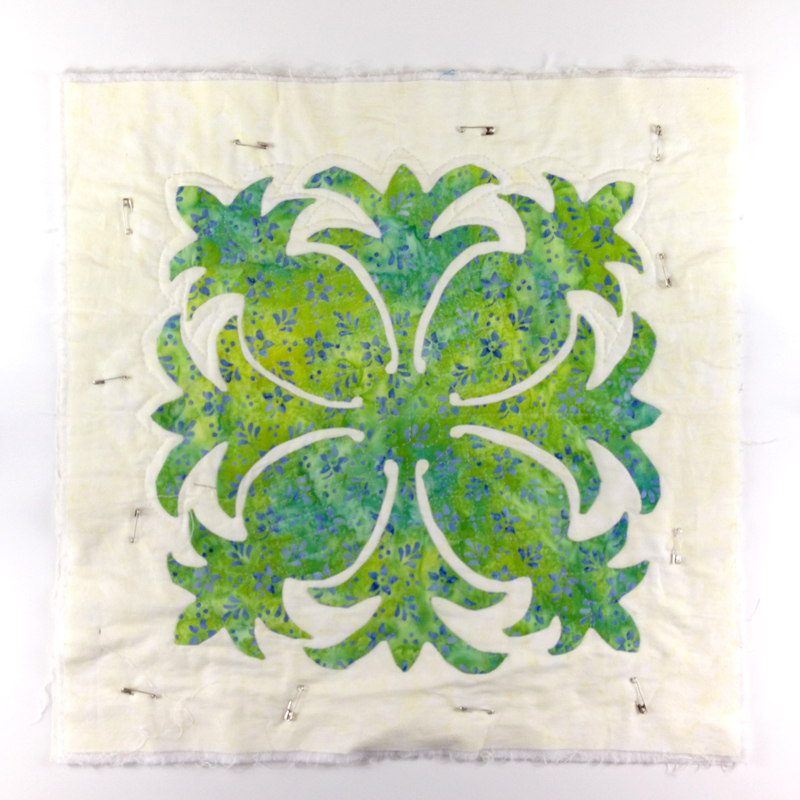 During one of my early visits, I signed up to take a Hawaiian quilt needle-turn applique workshop at a local quilt shop. Unfortunately the class was cancelled because of low enrollment, but the shop staff encouraged me to try it on my own. I walked out of the shop with some advice and a kit and was ready to make my own Hawaiian mini-quilt! I needle-turn appliqued throughout that entire vacation. The craftsmanship in parts of that mini-quilt aren’t pretty but I powered through and picked up some tips and tricks online. I even tried hand quilting—something I rarely do which is probably the reason why the mini-quilt is unfinished. 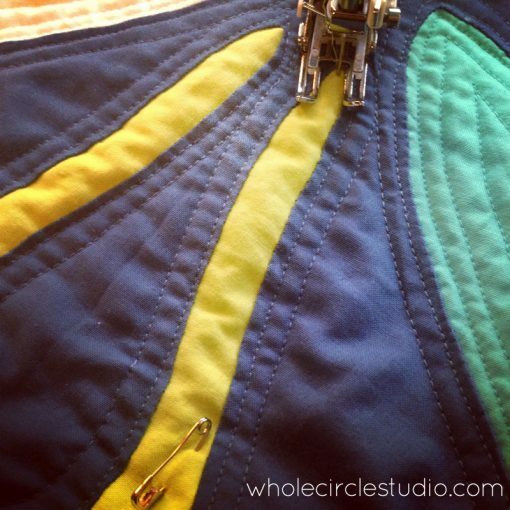 You can see that parts of the mini quilt are still pin basted. As part of the preparation for last trip I took to the Big Island in early 2016, I designed a Hawaiian inspired quilt that I could work on while traveling. After playing around with a number of motifs, I decided to go with what I later named Big Island Blossoms. Before the trip, I machine pieced the curved background of the blocks. 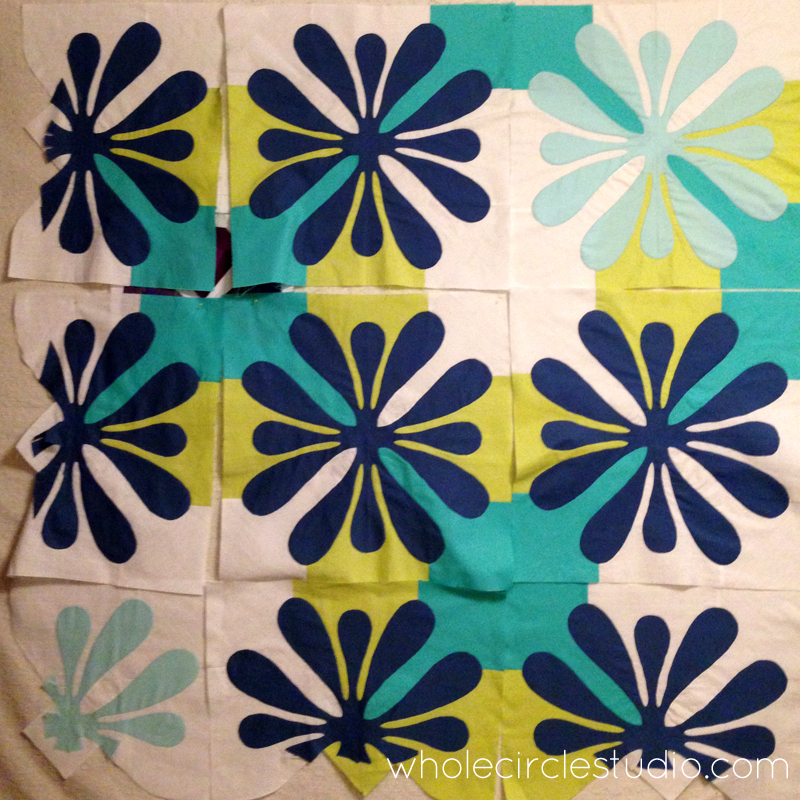 I also cut, pinned and basted the applique to make nine blocks to take with me. 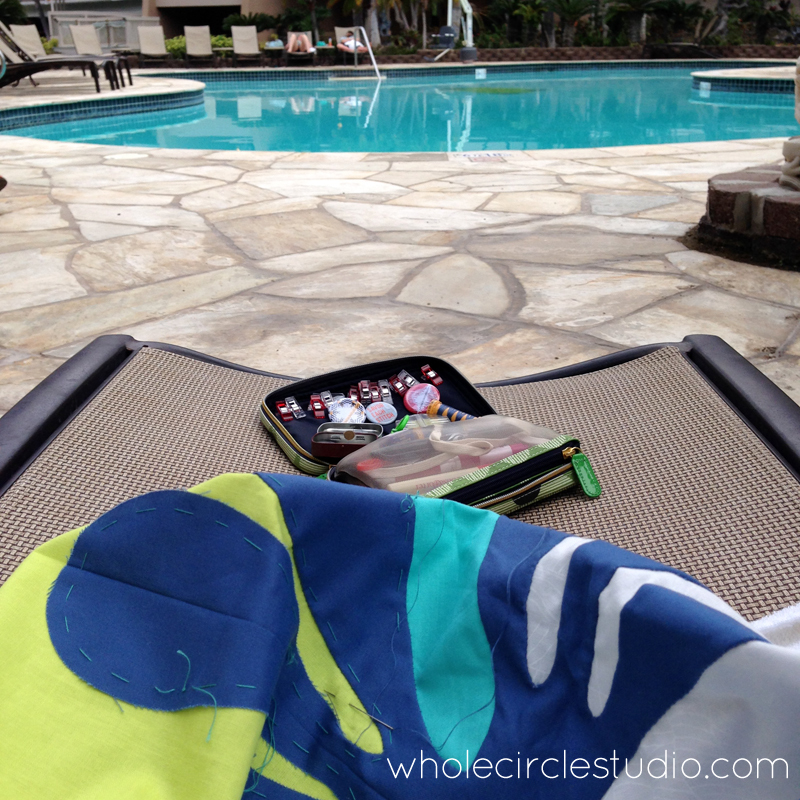 … and continued poolside on the West Coast of the Big Island. By the time I returned home a few weeks later, I had all nine blocks complete. After living with the block arrangement on my design wall for a couple of weeks, I decided it needed to be bigger. I made a combination of seven additional half and quarter blocks. Once they were complete, the hand appliqued blocks were machine pieced together. 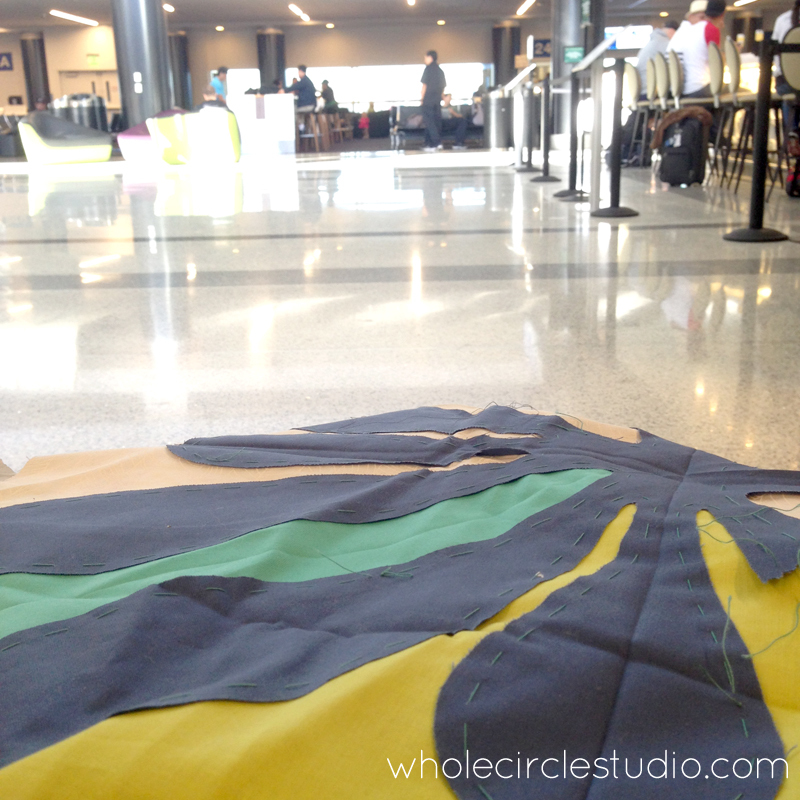 And then came quilting—lots of echo quilting with my walking foot. The finishing touch was attaching the binding— a print from the Shimmer Collection by Jennifer Sampou. One of my favorites! I also used this print for the back. 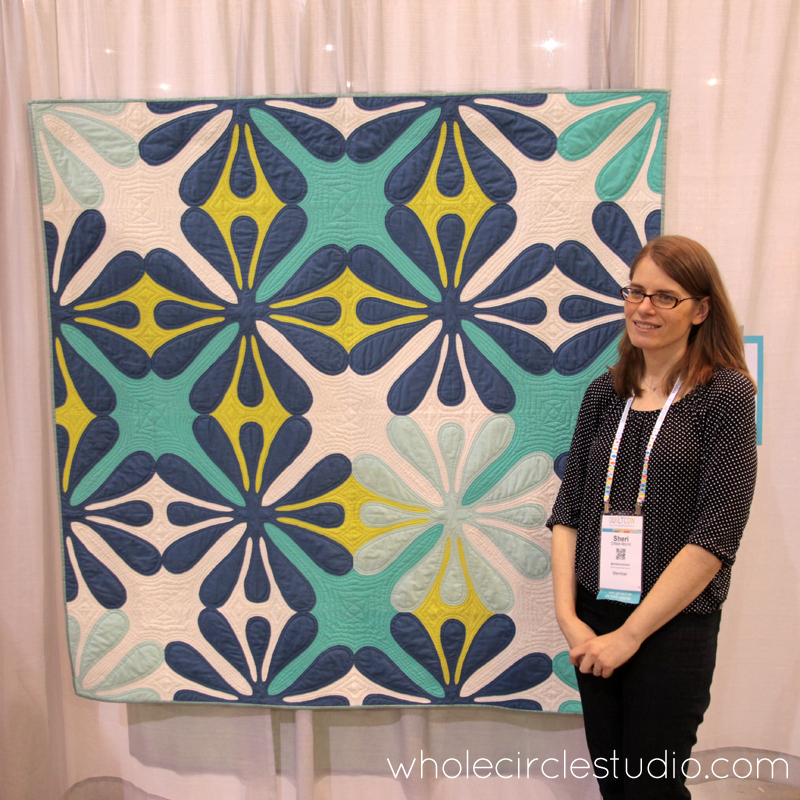 About a year after I started Big Island Blossoms, it was at QuiltCon 2017 in Savannah, GA. 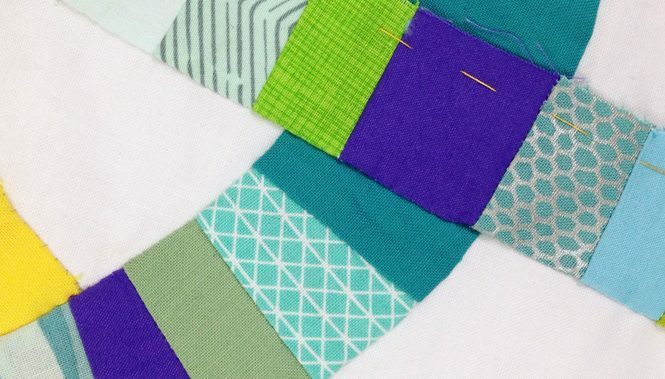 Looking for inspiration to start your own Hawaiian-inspired quilt? 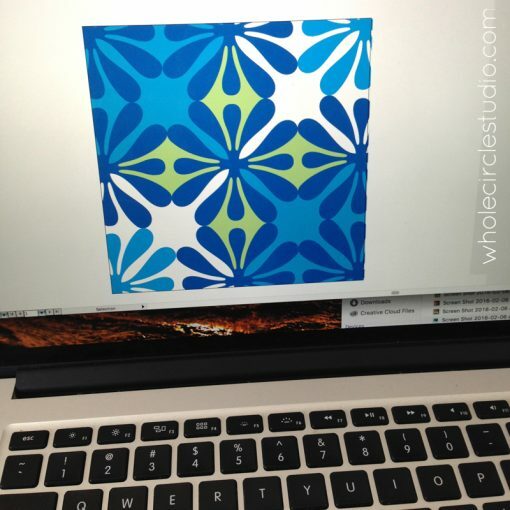 I’d love to have you join me in one of my Hawaiian Applique Made Modern workshops. 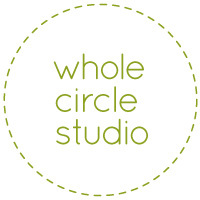 Check out my teaching schedule or contact me if you’re interested in me teaching at your guild or shop. I love sharing this technique with others and my students have enjoyed the process! 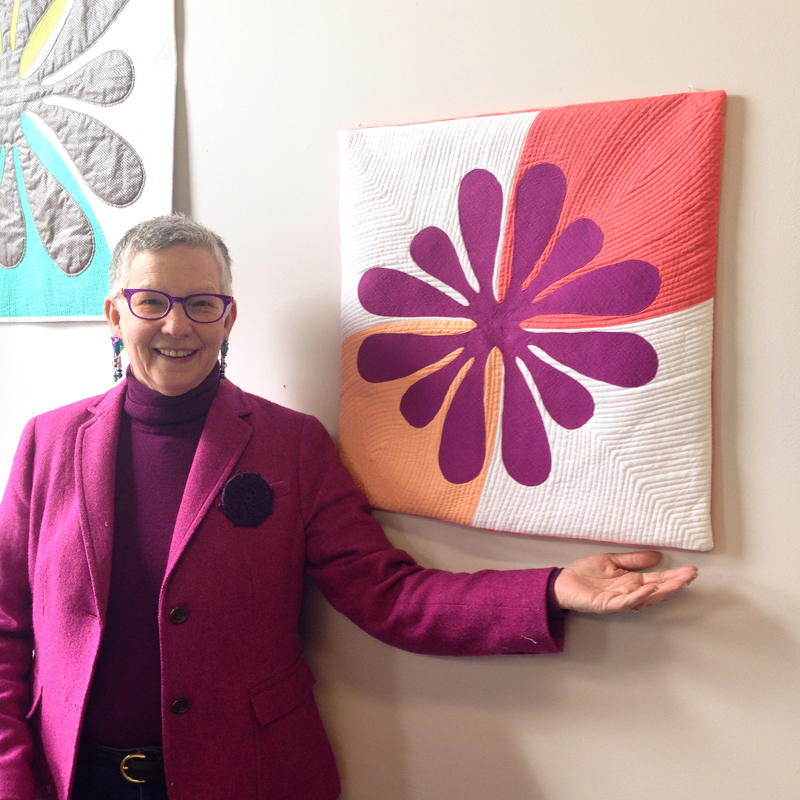 Pat Ryan, shopkeeper of Ryco, Inc. color coordinating with a Big Island Blossom pillow by Sheri Cifaldi-Morrill | Whole Circle Studio. 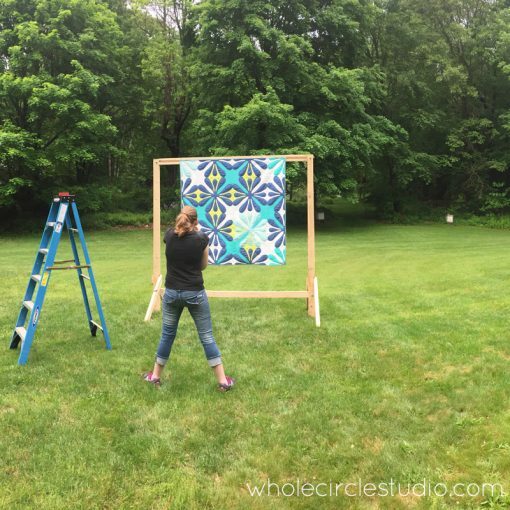 Be sure to check out the segment I filmed for Fresh Quilting all about designing your own Hawaiian inspired quilt. 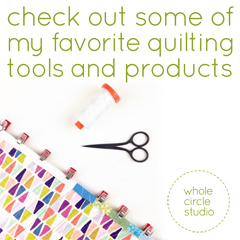 Want more tutorials, quilting tips and updates from the Studio? Click here to subscribe to my newsletter, Three Things Thursday. Isn’t it funny how plans don’t work out the way we want and then we discover something even better? 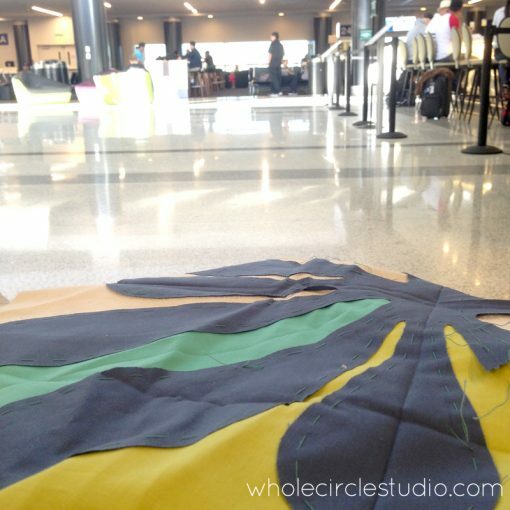 I love the journey and story about how you got into Hawaiian applique! So beautiful and original! 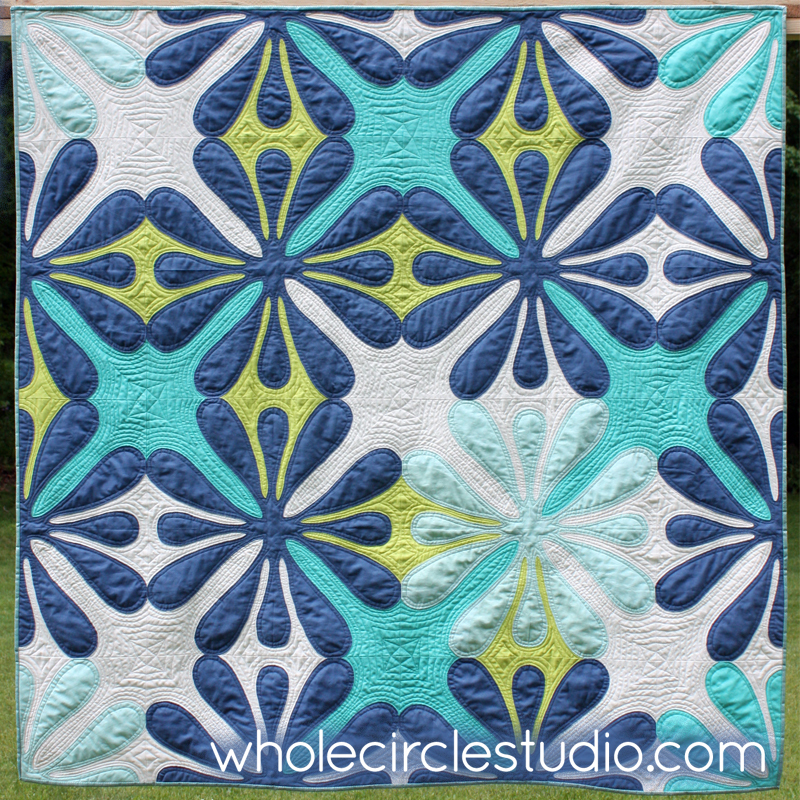 Love your choice of colors and the stitching on your quilt. Simply amazing!! 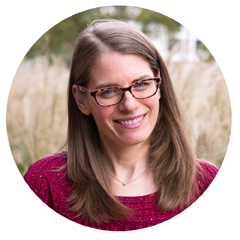 Hi Rhonda, Thanks for visiting the blog and for your kind words! My inspiration, Hawaii, holds a special place in my heart! Hi Adamandia, You certainly could do that! Only two things you’d want to pay attention to: The size of your fabric that you’re cutting your applique graphic from (I tend to make my piece only slightly larger than the folded applique). You’ll want to make sure you have enough negative space. Also, I typically build in my seam allowance to my applique. If you were happy with your reverse applique being a bit smaller (just keep an eye on tight areas), it would totally work! Sheri, your quilts are beautiful. Long story short! Hubby was in HI in US Navy; only son worked in HI for 5 years. 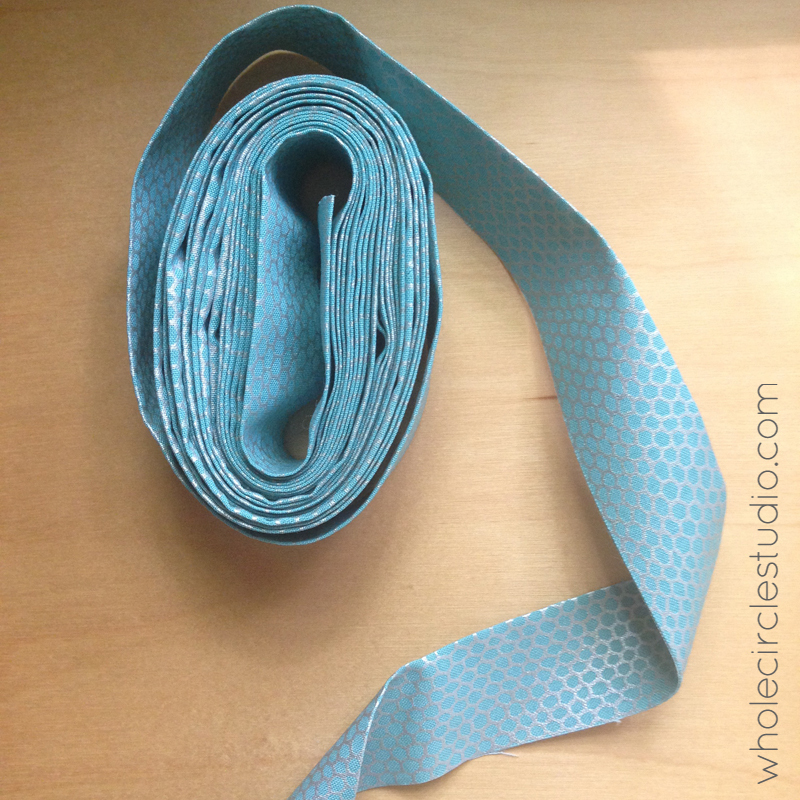 Son gave me stacks of precut squares in 3 sizes of HI fabrics. Any suggestions for quilt? I love the medallion quilts; but, would love to do something with a fish theme as he has small children. What’s your take?